Brazil Indians squat outside Brazil's World Cup venue"We came here to resist," said Arassari, a Pataxo Indian. Just next to Rio's mythical Maracana soccer stadium, the venue for the 2014 World Cup final, dozens of Brazilian Indians are fighting to keep control of a rundown building the authorities want to turn into a shopping mall. Since 2006, members of Indian tribes including the Guajajaras, Pataxos, Tukanos, Fulnio and Apurinas have been living in mud huts around the dilapidated structure, which once housed the Museum of the Indian.What the Indians are fighting for:City officials want to turn the area into a shopping mall or an annex to the Sports secretariat. But the Indians want it as the headquarters of the city's first indigenous academic institution where ancestral skills, Indian history and culture would be taught.How they're fighting for it:In the "village," Indians prepare traditional meals and organize public lectures, body painting, dances, and Guarani-Tupi language courses. They have created a website to publicize their projects and hope to launch online television in 2012. 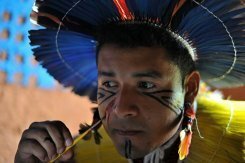 "We want to show Brazilians that Indians are not all the same, that there is a huge cultural and ethnic diversity that needs to be valued and protected," said Afonso, an Apurina Indian.Comment: Note the points here that you won't see in a typical movie, novel, or comic book about Amazon Indians. 1) That the Indians don't live only in remote villages where they still dress in loincloths and hunt with spears. These are modern people living in Rio de Janeiro, a modern city. 2) That they understand and use modern technology: television and the Internet. Indeed, it sounds like they know more than some US politicians and executives who never touch a computer. For more on Amazon Indians, see Amazon Worldview Influences Avatar 2 and Baptists Want to Save Indigenous Souls. Below: "Arassari, Brazilian Indian from the Pataxo tribe from Bahia, paints his face in the garden of the former Indian museum in Rio de Janeiro in 2011. Indians occupy the old museum, which is to be converted in a shopping centre for the 2014 football World Cup. The Indians want to keep the building to create the first Indian university." Modern means to be relating to the present time. Indians in the rainforest who really do wear loin cloths and hunt with spears are just as part of the present as Indians who choose to live in the city. Both are "modern." Why do you always talk about traditional Indians like they're something to be ashamed of? "Modern" means relating to the present, not to the past. If someone's apparel or weaponry hasn't changed since the distant past, I'd say it doesn't qualify as modern. You're imagining that I talk about traditional Indians a certain way, or that I'm ashamed of them. Both claims are false. I generally discuss traditional Indians only in context of people stereotyping them. If these Indians are happy to live in traditional ways, I'm happy for them. Really, find some examples of my saying that traditional Indians should give up their ancient practices and adopt modern ways. With very few exceptions, you can't do it. Why not? Because I rarely if ever say things like that.